One year after completing treatment for prostate cancer, Brad Glassel donated a bell to UW Cancer Center–Johnson Creek for patients to ring to celebrate the end of their treatment. 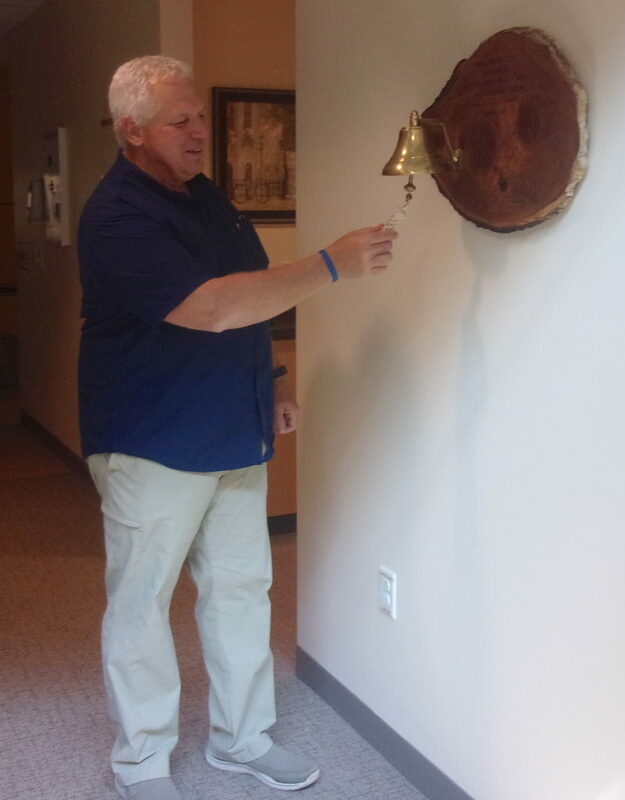 Brad Glassel rings the end-of-treatment bell he donated to UW Cancer Center–Johnson Creek. When Glassel donated the bell, his treatment team encouraged him to be the first to ring it. “Ringing the bell was pretty emotional. It brought me back to that time,” Glassel says. Glassel was diagnosed with prostate cancer in March 2016 and began Lupron hormone therapy, followed by five weeks of external beam radiation five days a week under the care of Dr. Jessica Schuster, radiation oncologist at UW Cancer Center–Johnson Creek. He then received brachytherapy—a type of treatment in which a radioactive source is inserted directly into a tumor to deliver a precise, localized dose of radiation—under the care of Dr. Gregory Cooley, radiation oncologist at the UW Carbone Cancer Center. Treatment was difficult for Glassel. Like many patients, he experienced depression. He found that talking to other patients, volunteering for various cancer fundraisers and going on adventures with his wife, Alicia, daughter, Hope, other family members and friends have helped him “move on.” He hopes the bell will encourage patients to reflect on where they’ve been and what it means for them to move on.